Participants commented to three exhibitors presentation at booths, "Explanation is easy to understand by reviewing actual products", "So how much is it?" and "Does it work so simply?" and etc. ・NANIWA IRON WORKS CO., LTD.
"Multi Eye Bolts" provide with safe transport, lifting, and mobile installation of heavy items at civil engineering and construction. Its leader line "Multi Eye Bolt Hybrid" is enable to support heavy load even with a smaller body. Eco-Friendly Removal Agent, S-PURE SJ-Gel, ia a functional gel without containing any nitric hydrofluoric acid for stainless steel. No requirement of electricity or special facility is required. For usage, just paste the agent and wipe it from a weld burnt part. 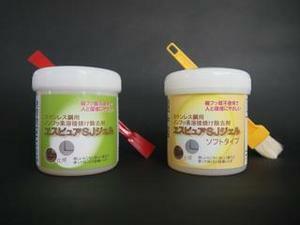 ・MARUICHI CUTTING TOOLS CO., LTD. The sheet surface of hydraulic parts is an important section where hydraulic control is performed. 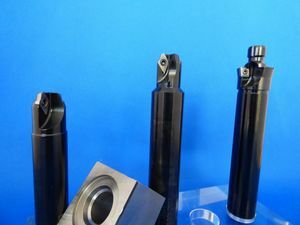 Maruichi succeeded in changing the tool exclusively for sheet surface processing, into tip replacement-type model, which helps reduce costs for customers.